Ain't no party like a Peanut Butter pool party! A pair of (very) short film clips. 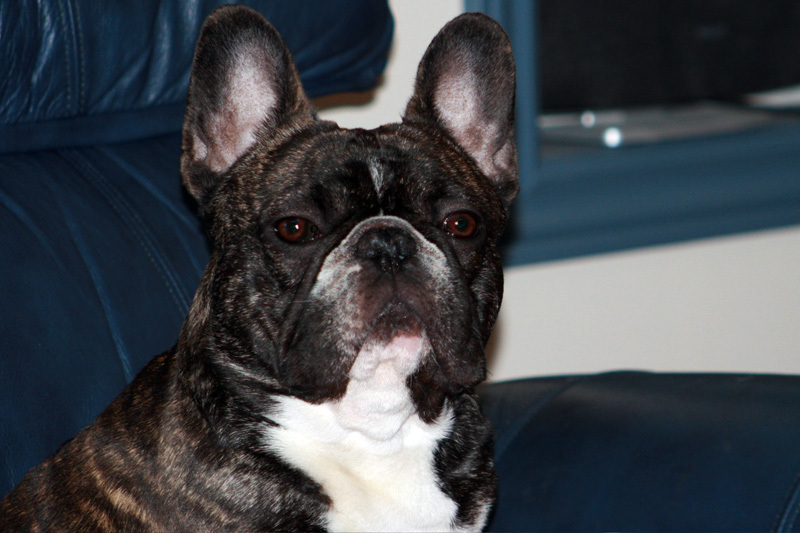 The first is of Dexter doing his second story, dinner time, crate jump. The second film is a lucky capture. The day before Vela went home, I’d told her new mom, Melissa, that Vela always had to have something in her mouth – very much like her Uncle Dexter, actually. Later that evening, I was out in the yard doing poo patrol. I’d put down the long rake type implement I used for scooping, and two seconds later I saw Vela bolting across the patio with it, a trail of fascinated puppies in her wake. I ran for my video camera, and caught her doing the same thing on her second pass. That’s a mighty big pole to be carried by such a small puppy – I hope Melissa knows what she’s in for! 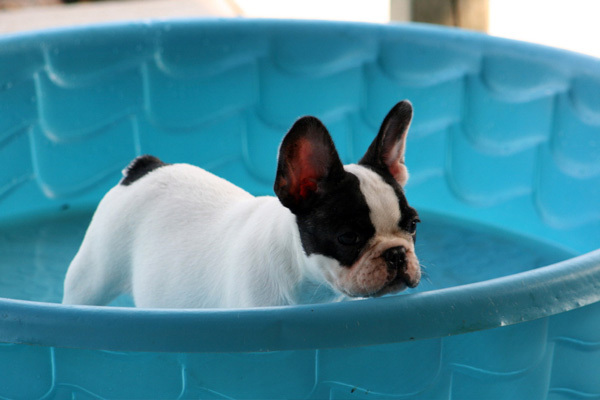 Added bonus: New puppy photos, including Peanut Butter pool party! The hot weather has Pickle, Pammy, Luke and PB hanging out in the wading pool, but no one loves it more than Peanut Butter, who’s been known to flop down and nap in there. The other night I did what I usually do while cleaning, and tossed Dexter outside into the fenced yard. It’s fenced with five foot chain link on three sides, and a 4 1’2 foot stone retaining wall on the fourth. 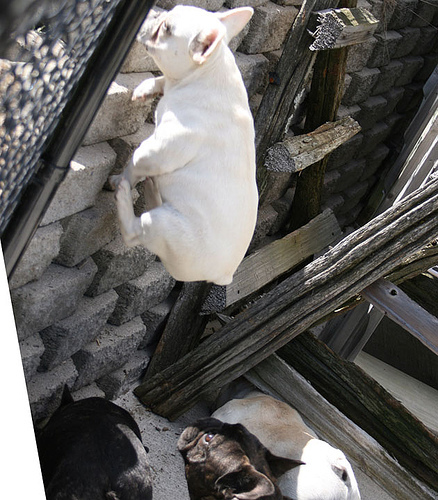 The only dog it hasn’t been able to hold is Tula, who we discovered could – and would – happily scale the wall if it meant she could get to where I was at. Thankfully, unless I’m outside the yard, Tula never bothers to try to escape, and she’s never allowed access to this part of the yard if I’m not at home and watching her. Dexter is home, and boy – did I forget how much trouble a young, rambunctious, adolescent male who also has the ability to vault himself onto the backs of chairs can be! So far, he and Elliott have paid no attention to each other, which is likely because they have so many other things to pay attention to – namely a house full of girls in season. Elliott is in an advanced state of Mc Lovin’ mode – any attempt to remove Bunny from the same room he’s in brings on the most heart breaking yodeling, in which he can clearly he heard to screech “I wurve you BunBun!” (or words to that effect).